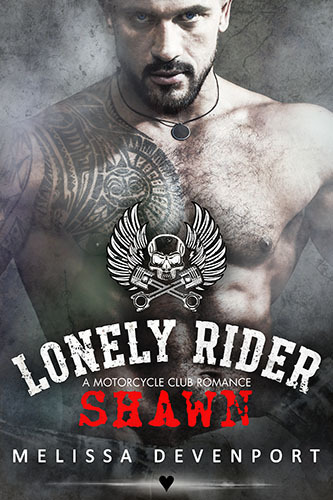 Lonely Rider MC – Shawn – OUT NOW! Shawn, the seventh book in the Lonely Rider MC series, has just reached Amazon. Spoiler alert for all of you who loved Ryder; he appears in this one too. A Motorcycle Club Romance by Melissa Devenport. His body is all dangerous, masculine power. Her whole reality implodes when she is forced to realize that her life will never be the same. Kayla always had a feeling that her father’s business connections weren’t the healthiest. Now it’s finally confirmed in the worst kind of way. Shawn comes from a very different background. It’s easy to see on his large tattoos and rugged looks. He is assigned to keep her alive. Her feelings are mixed to say the least. He’s the most powerful man she has ever seen. Shawn is forced to take the job, but soon realizes that his feelings will make the mission complicated. Kayla is so very alive. So vibrant. So beautiful. She’s like a missing angel from heaven. All books in the Lonely Rider MC series are steamy hot romance adventures with no cheating, no cliff-hangers and HEA.